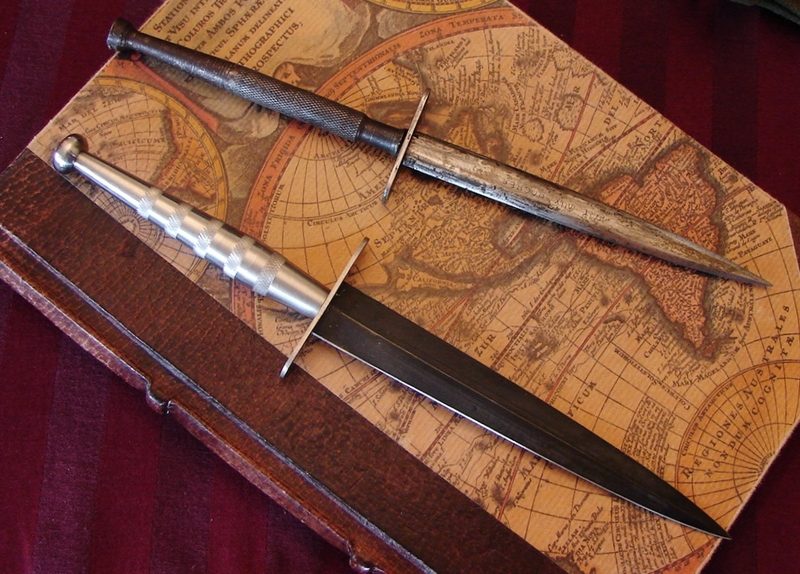 At one time I only had two French Commando daggers. Things have changed dramatically and now i have a very nice collection of them. Most of them are post World War Two, very well made, and are uniquely French, having longer blades and shorter handles compared to British F-S knives. The exception are the Steel hilt "Nail head" knives which were made in England and therefore have typical British F-S proportions. Since I have made mention several times in the following notes to knives from the Algerian conflict I thought I would add some historical background. The following information is from the Encyclopedia Britannica. 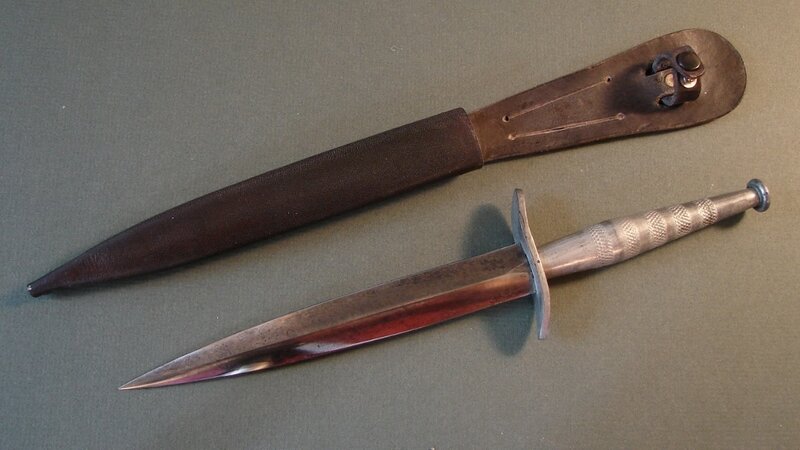 Below: Another unusual variant French dagger. Of course according to the seller it is very rare. I haven't a clue if it is or not but it is a very nice knife. I do have a similar one with a blade more like and American M-3 trench knife. I haven't posted it on here yet. Below: This knife is from the same dealer as the Paratrooper commemorative below but this one is a keeper. It has a brass handle like a second pattern. The blade is in near mint condition with 100% finish. The blade is also heavier, as indicated by the triangular flats where it enters the guard. The camouflaged sheath looks like a painting by Marc Chagall or some modern impressionist. 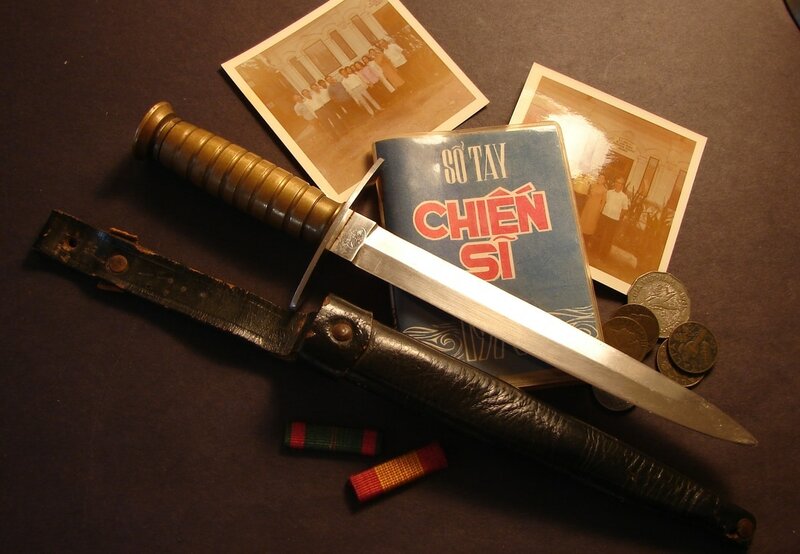 The knife sheath is like the usual Le Commando by Super Nogent with the boot/belt clip in the back.The knife is also from the era of the Indochina or Algerian wars. Below: The quality of this knife was so awful I returned it. The dealer was very upstanding and paid for the return shipping. A French F-S awarded at Graduation from the French Paratrooper school. The 7-1/8" double-edged blade is engraved on one side with the French Military Paratroop insignia, and: "PARACHUTISTE FRANCE / ETAP PAU/Brevet No.____________ 1966". 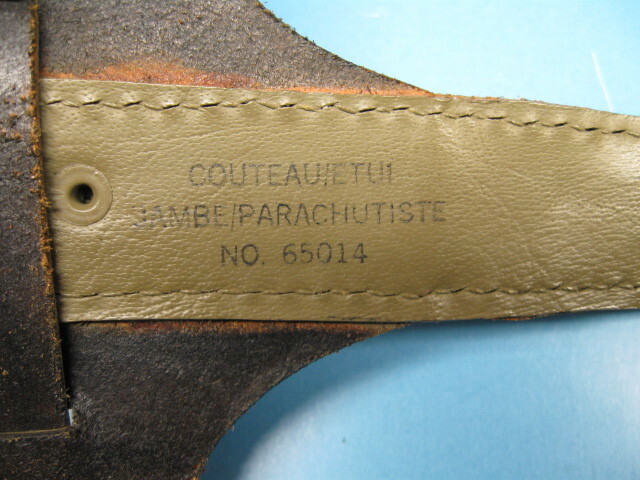 This translates to: "French Paratrooper / Pau School for Airborne Troops /Certificate No. ____________ 1966". First, and only, time I ever saw one of these daggers was in Leroy Thompson's book "Commando Dagger". If you don't have a copy of the book it is a good one to own. 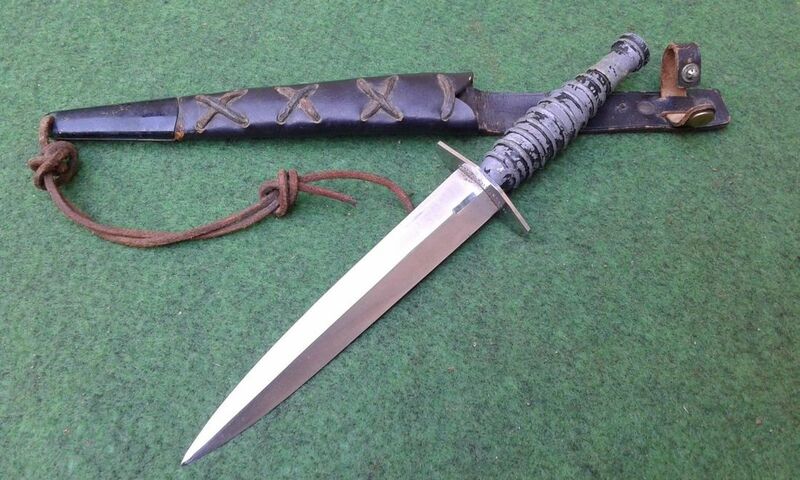 Below: This is a French Commando Knife made by Begon. In typical French fashion the handle is much shorter than those on British Commando knives. 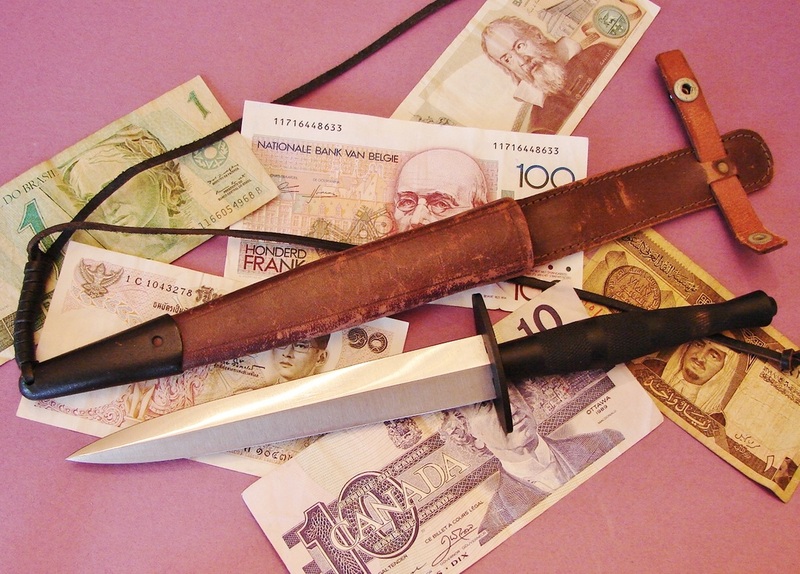 Below: Modern French Paramilitary dagger with sheath. 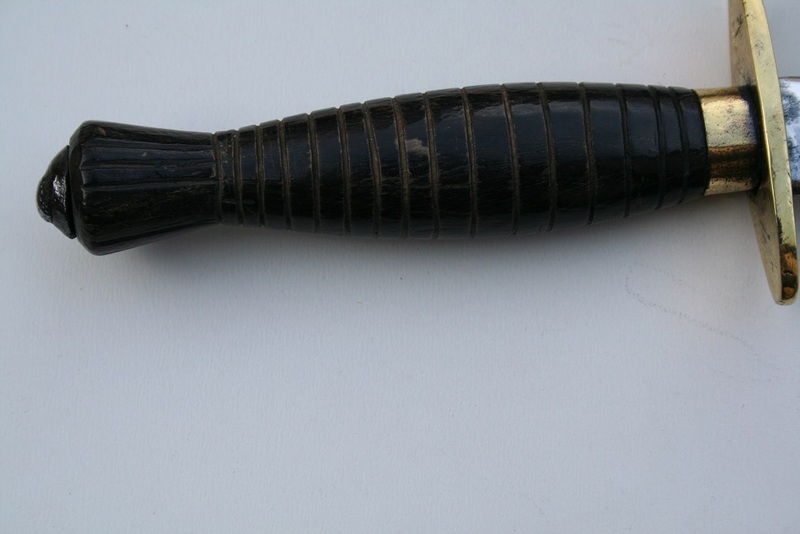 The pommel of the plastic type handle is incised with parachute lines ending in a star. I do not know the exact age of this knife. It is coming direct to me from a friend in France. Stainless steel (INOX) blade and guard. Traditional style leather sheath. By the way, if you find a knife on Ebay being sold by a Frenchman using the name Harry Callahan you can trust him. 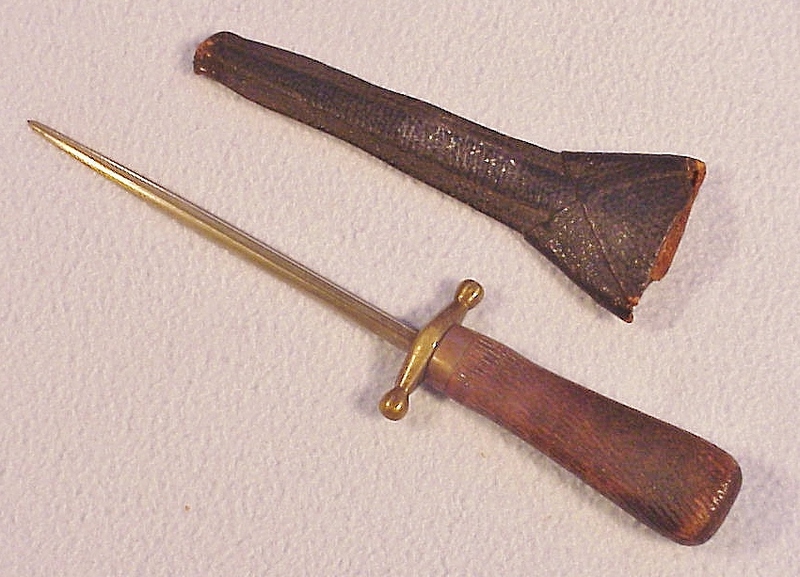 Below: An unusual French dagger produced in the 1960s. Each knife was hand-made, assembled, and numbered. This Coustra knife has an aluminum handle. The aluminum guard has been bent, broken, and repaired at some time by brazing. I got this rare knife from a good friend in France from whom i also bought the Begon and Baroud commando knives. 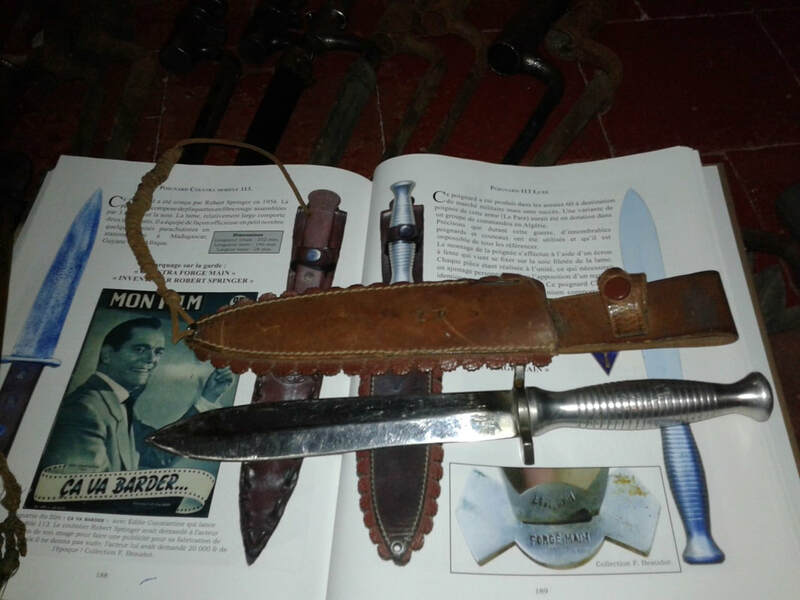 The book is "French Military Knives" by Christian Mery. It is an excellent book if you can find a copy. Another good friend donated this copy of the book (in English) and shipped it to me from France. The knife has a nice feel, although in typical fashion, the handle is short. 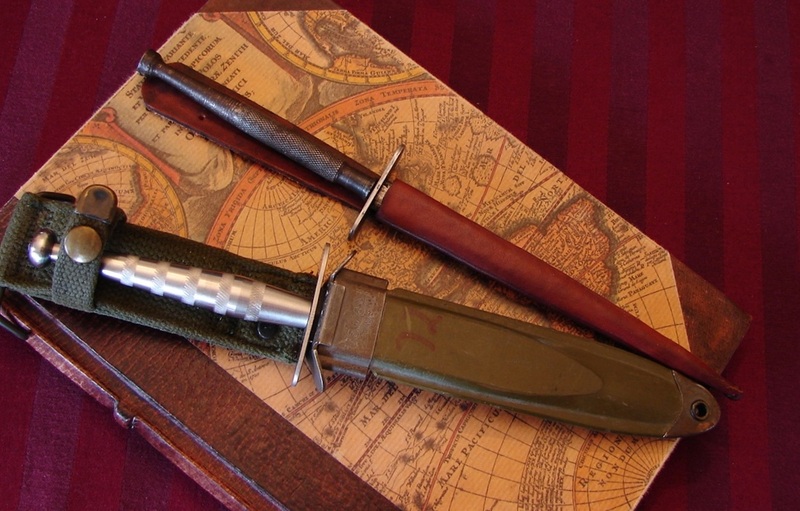 Below: Two French Command daggers, one for the Special Beret rouge on the left, and the more common Super Nogent Le Commando on the right. My friend Fabrice Beaudot informs me this was an extended version of folding knives made by "NOXI" of France, and shaped in a similar style. 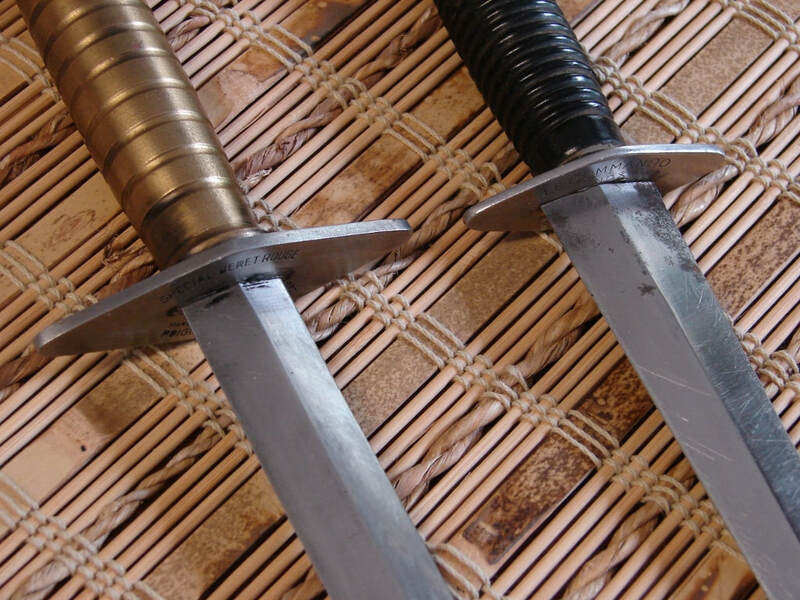 The fixed blade is more correctly considered for hunting than combat. It is fairly modern knife with a rather shapeless 10 inch stainless blade. The handles are cast aluminum textured to look like jigged bone and fitted with stainless steel liners. 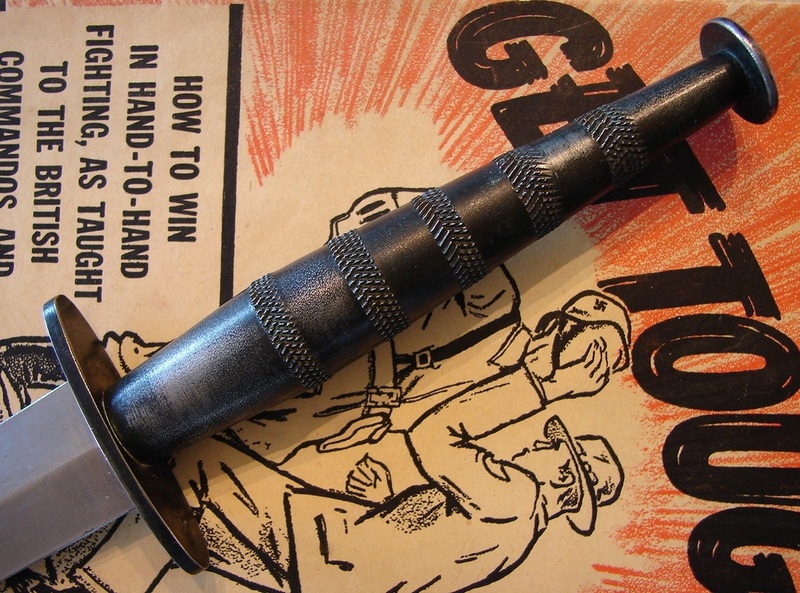 Below: Another "Nail Head" French Resistance knife we added to our collection. It was part of the box of goodies donated by our generous friend. Below: Another very nice dagger from France from the same dealer as the Baroud knife.This one was made by a company named Begon. It appears to be of fairly recent manufacture of very high quality. The handle is stacked leather washers but was described as wood. Easy mistake to make sometimes. For a long time I was hesitant to buy from dealers overseas but some of my most recent purchases have come from France, the Netherlands,Poland, Australia and even Latvia.The delivery time for the other dagger was quoted as three weeks but it came in under one week. 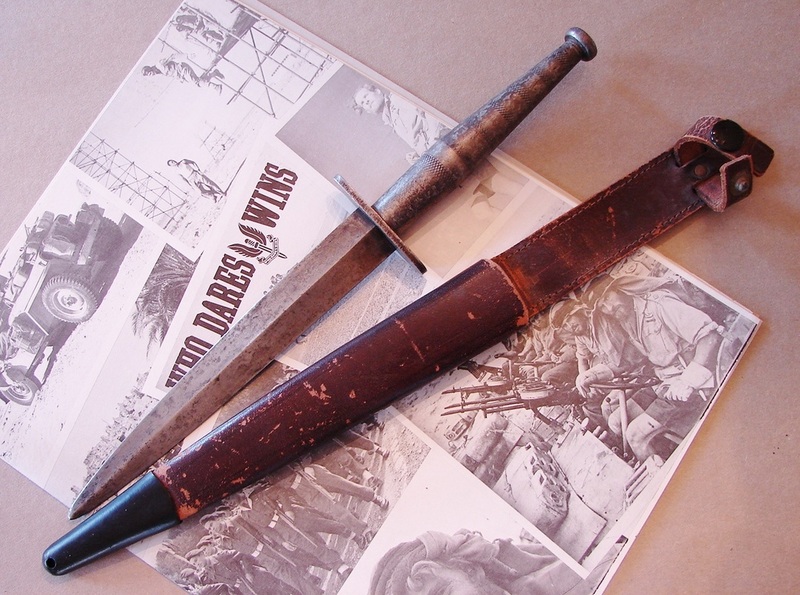 Below: French commando dagger by Baroud from the Indochina or perhaps Algerian era. The seller noted it was in perfect condition...... well at least it is in good condition. I'm pretty sure the handle was all black when it was new and in "perfect condition"! I may have paid too much for it but French commando daggers (especially by Baroud) are not easy to find in the USA. 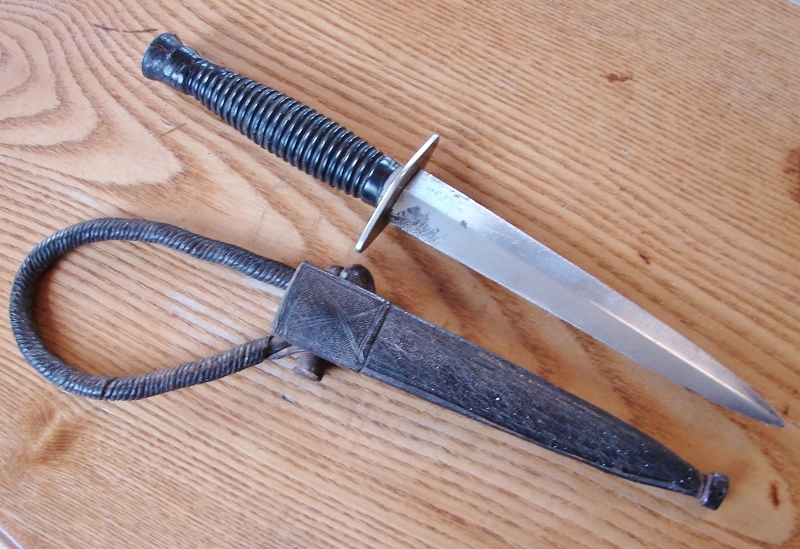 Below: Undoubtedly post-war, this French Commando Knife could have been used by a mercenary, a member of the French Foreign Legion or a French Commando today. The blade is well made, symmetrical and nicely polished. The steel guard is on upside down from the factory. I know this because there is a diamond shaped recess on top that was supposed to fit over the shoulder of the blade. The blackened handle is non-magnetic, brass I would suppose, based on its weight. It has three broad rows of knurling and screws directly onto the blade, there being no top nut. It is a well built knife and is completely sterile. 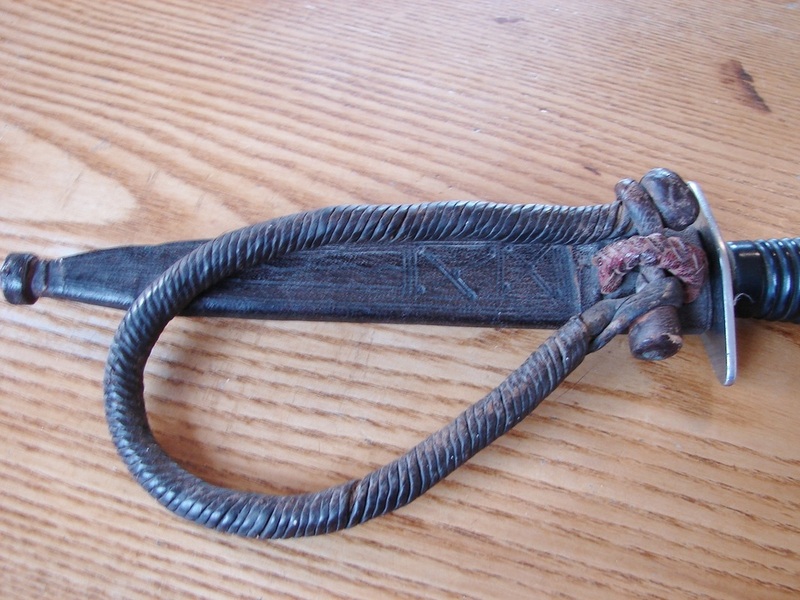 A traditional French sheath, complete with boot/belt clip, accompanied it. Note the similarity of this handle with the one on the above Carl Schlieper knife. Perhaps this knife was made in Germany and is not French at all? 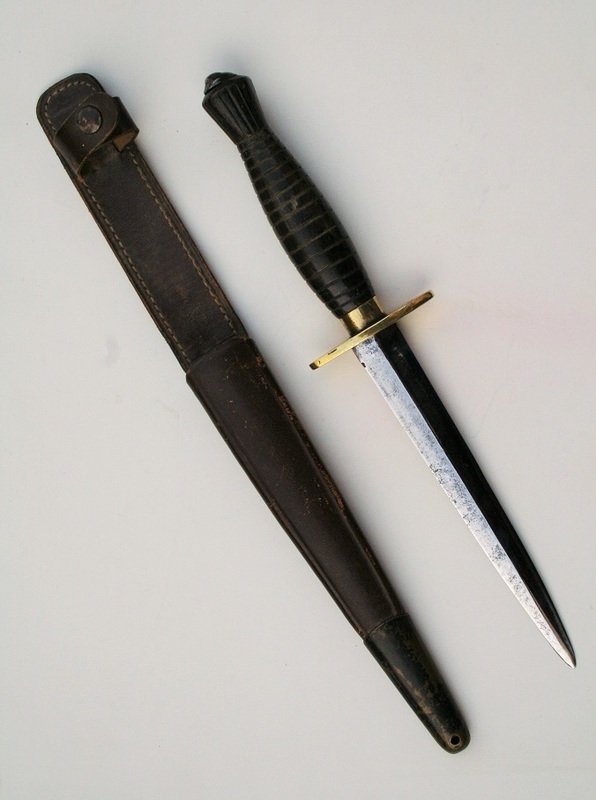 Below: A dagger which I assume was made in England but has provenance directly to the French Maquis resistance movement. A very well made and fitted dagger unlike any i have ever seen before. 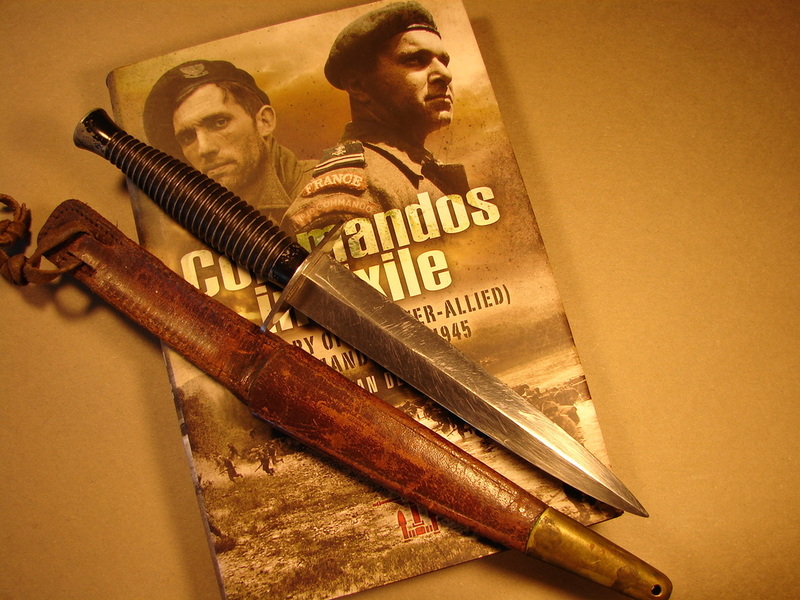 There seems to be no end to the diversity of WW-II Commando daggers. This has become one of my favorite daggers. There is something very appealing about the handle shape and the nice patina. Below: A very unusual French Nail Head dagger with a graceful 2 1/2 inch "S" guard. The handle and guard are made of steel. An exceptionally thick blade is highly polished unlike many of these knives which were supposedly made "Cheap and Dirty" for air drop into France behind German lines. 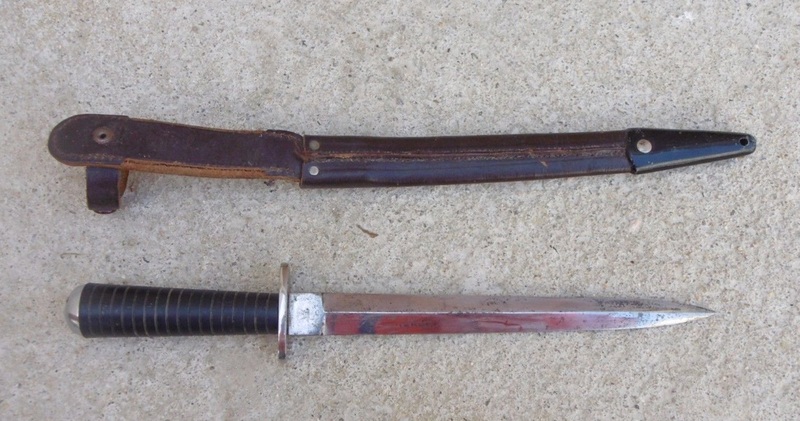 Below: This is another post WW-II French Commando knife consigned to the Indochina or Algerian conflicts. I bought it from a dealer in Latvia via the wonders of the internet. 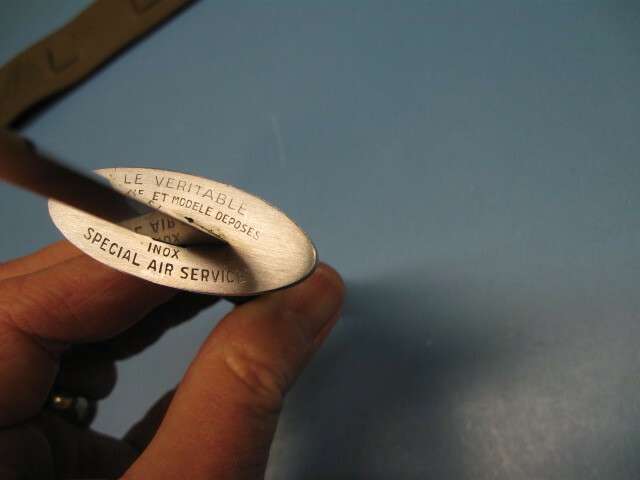 It is simply marked "Inox France" on the blade ricasso. It has its original well-made leather sheath. Below: I think this is a commercial or civilian throwing knife not a military knife. Maybe someone will provide me with more information about it. It is marked Modele "113" Depose. I bought it because I liked the shape of it more than for any other reason. I recieved the following information about this knife from a gentleman named Pierre Maraval. "I saw your post about the unknown French knife Modèle 113. It's a well known type among French veterans. It used to be made by a small "coutellerie" in Strasbourg (which was and still is very close to lots of regiments) known as Société Coustra (coutellerie strasbourgeoise). 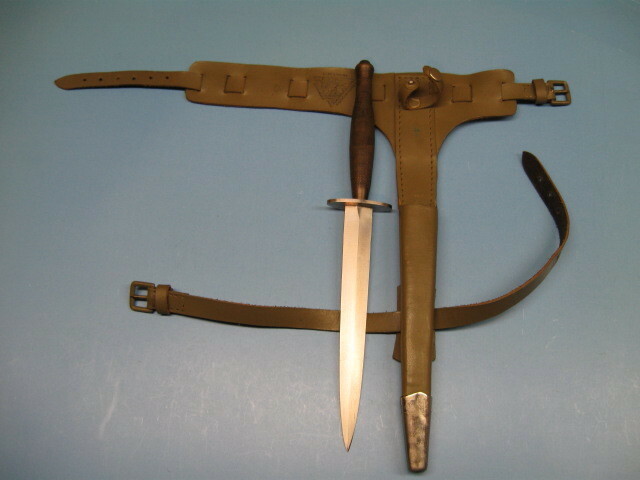 They were known as a better and more practical alternative to the US M3, the standard post-war fighting knife of the French army. 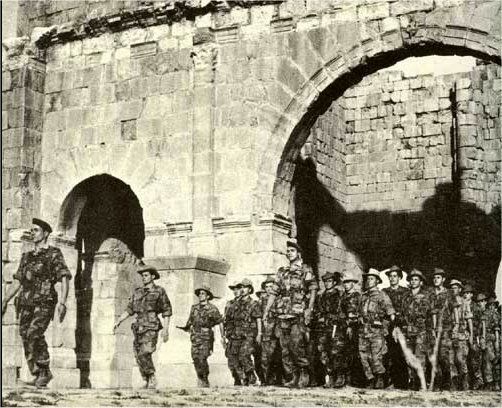 It is said to have been especially popular among Foreign Legion soldiers from the end of WWII at least until the end of the Algerian war. It certainly saw action in Madagascar, Suez, Indochina, Algeria, but was rather known as an everyday knife. While sharing the same name, not all models have the same quality or the same designs. I once read or heard that Robert Springer made them better by listening to visiting soldiers. Later models are not handmade." 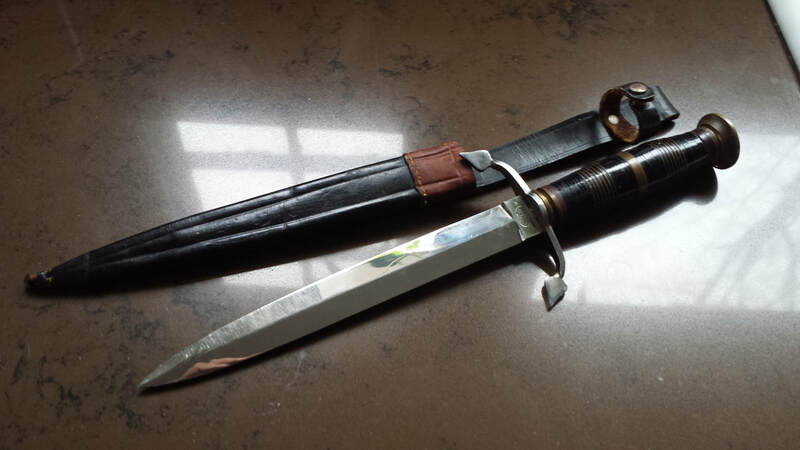 Below: Here are photos of a French F-S Commando style knife from my good friend Fabrice Beaudot. 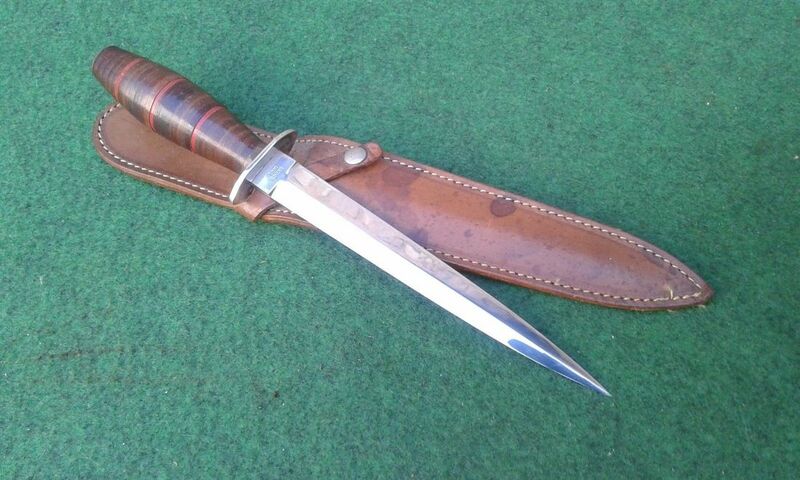 Hello, I send you the picture of my latest find a dagger type f / S but local manufacturing Indochina. the handle is made of buffalo horn it seems to be a local production of the Indochina war engraving on the cover [guard] represents an anchor Marine C is a craft engraving probably made by its owner for the brand under which it served weapon. good to you. This is a very nicely made dagger and sheath. 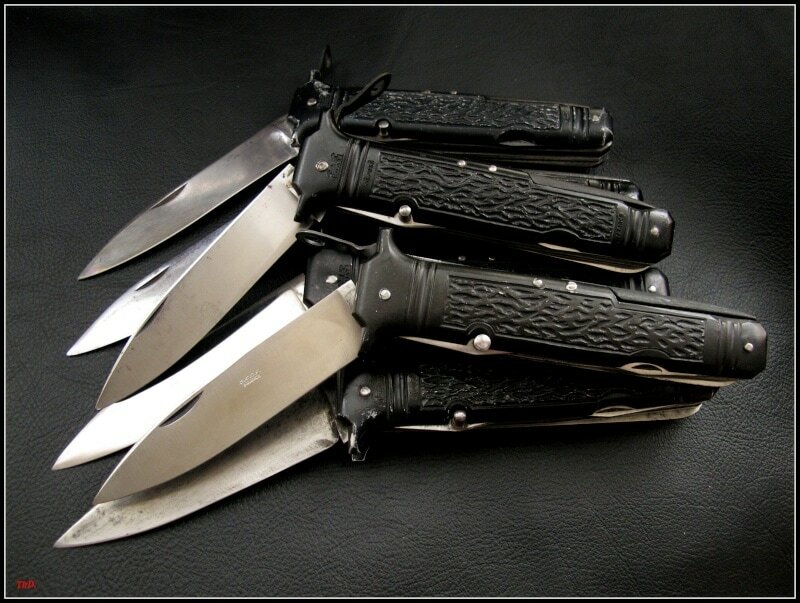 It is amazing how many cultures and military forces have adapted the F-S knife over the past 70 plus years. This is quite a testament to its enduring design, functionality, and clean aesthetics. Below: French SAS Paratrooper knife. It is in mint condition including its original sand colored arm/leg sheath. These are quite difficult to find here in the USA. I am very pleased to have added it to our collection. The knife is well made although the tang is ground off center. Below: Another Le Commando by Super Nogent. It is sheathed in a native-made leather sheath originating somewhere in North Africa. The question is who carried the knife, a French soldier, or a Native? The sheath is known as a Tuareg wrist dagger style in which the loop is slid over the wearer's arm with the knife hidden up their sleeve. This is a lot of knife to hide on one's arm! Below: A knife belonging to a man named Nordquist. I have no idea whether he was an American or a Frenchman but it is definitely a French "le Commando" knife. Mr. Nordquist served three tours in Vietnam and has engraved the dates into the blade. I wish we had more of his story to share with you. Maybe someday it will come to light. 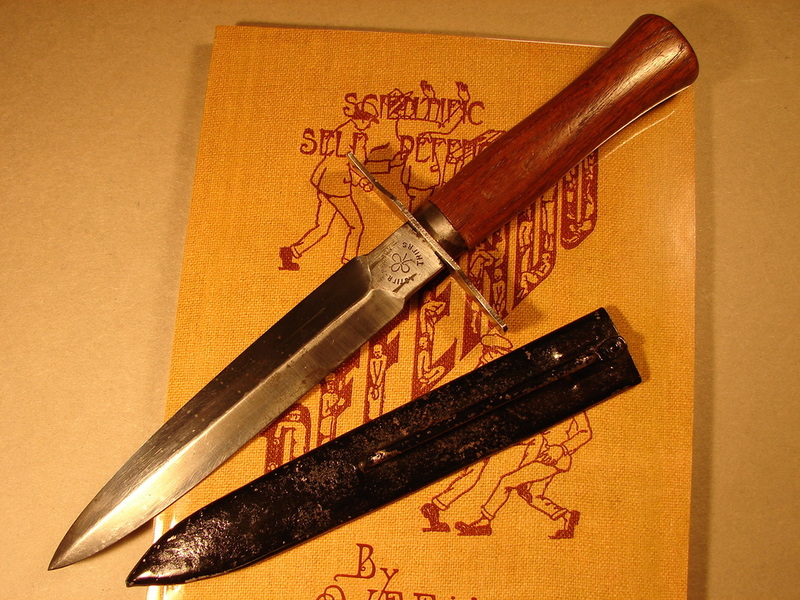 This same knife is also illustrated in a French publication on fighting knives. 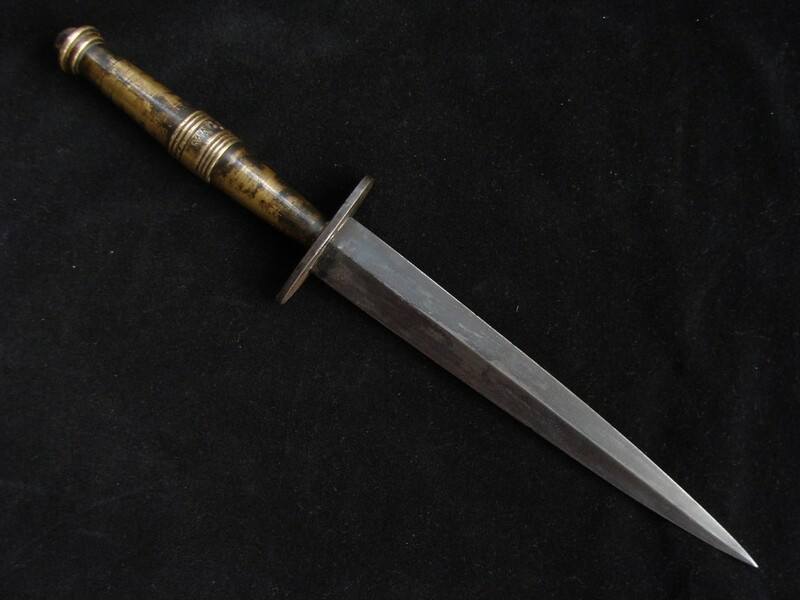 Below: Another French dagger from the Indochina War era. It is very well made with an eight inch blade of what appears to be stainless steel. Some sort of black hard nylon or plastic is used for the handle. This material is common among modern French knives. The handle shape dates back to the 1833 French dagger. 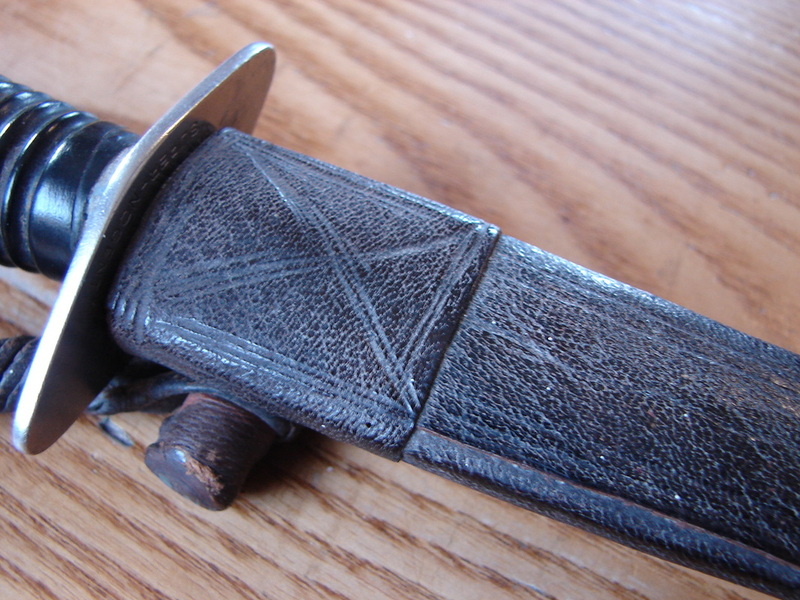 It is fitted in a nicely made leather sheath that puts most British sheaths to shame. Below: Your guess is as good as mine. WW-I or WW-II? This dagger could have served in both wars equally well. Likely used by someone in the Maquis Resistance. The blade is cruciform shape and comes (I think) from a Lebel bayonet. The wood handle has been neatly stippled for a better grip. A small brass guard and a brass ferrule are neatly fitted. All in all a very professional grade conversion. 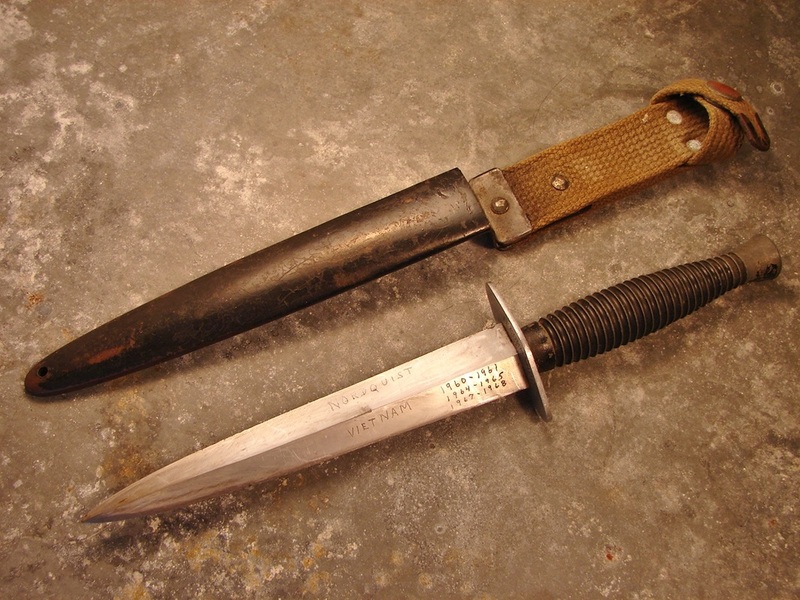 There are more French knives found on the page for Post War knives. Often referred to as "nail heads," these knives' handles are very distinctively shaped. The handles are turned from steel and have bands of very fine checkering. Reportedly they were made in England for the French Resistance movement and parachuted in by the case full. That leads me to question, where the heck are all of them today as they are among the most scarce of the F~S knives. Two of my knives (seen further below) have broad arrow stamps on the guards and no other markings. 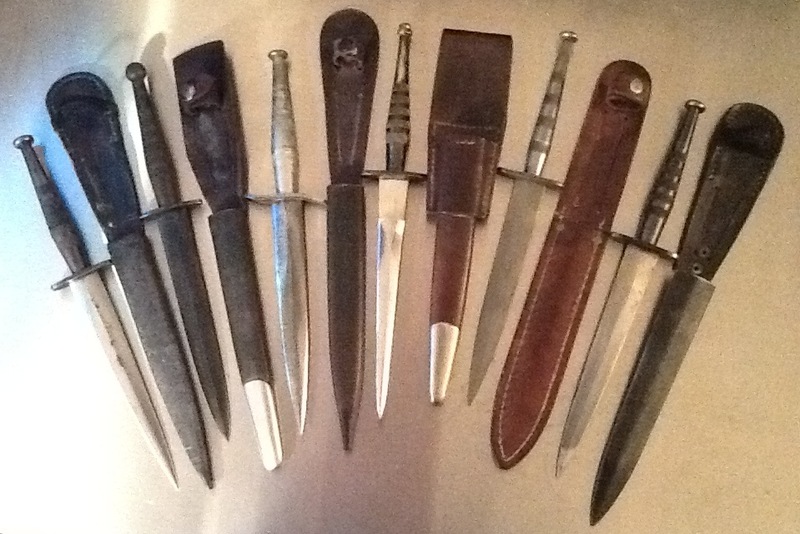 Below: A very nice array of rare Steel Hilted French Maquis Resistance daggers (not my collection). Some researchers believe the knives were made by H.G. Long in England but I do not have any documentation to support that theory. I do know that some of them were issued to the members of the British Home Guard. We now own the 3rd knife from the left with the rare "S" guard and the knife with the tablet ricasso to the right of it. Two different styles of Broad Arrow found on the knives to the right. 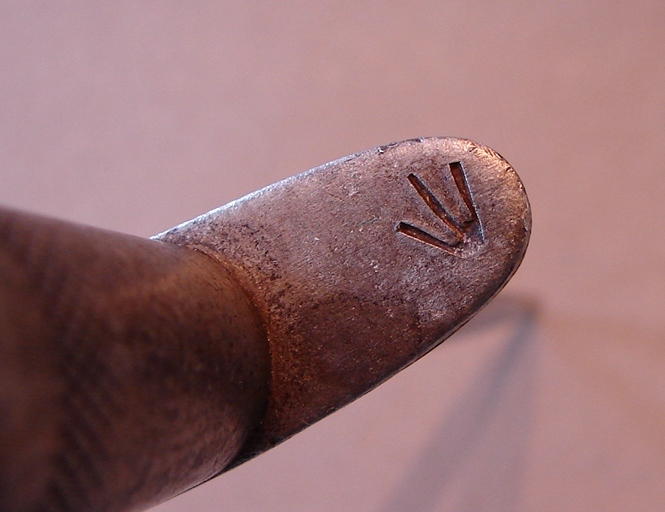 The presence of a broad arrow would indicate MOD acceptance of the knives for issue to combat forces. 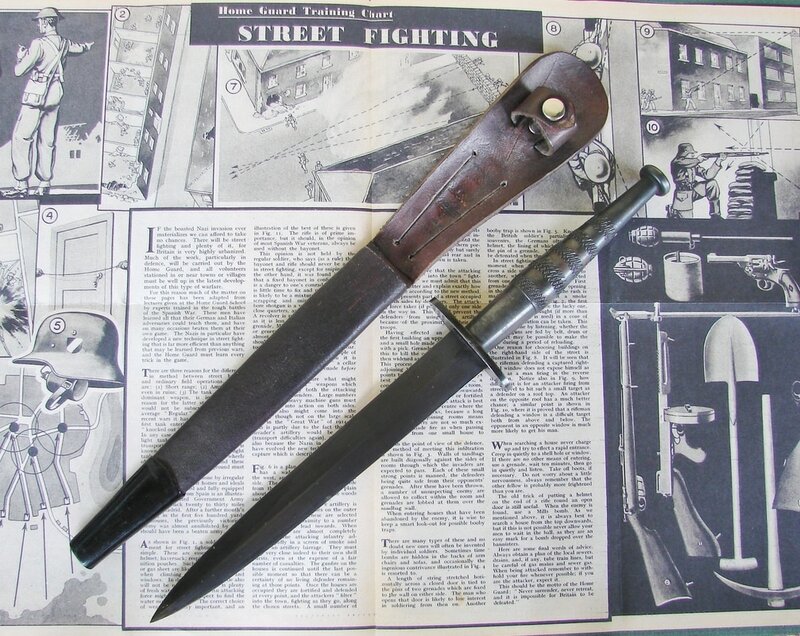 Two examples of vastly different Nail-Head French Commando Knives. ABOVE: A totally different handle style. The rings are actually raised above the handle surface. This gives a much better grip. 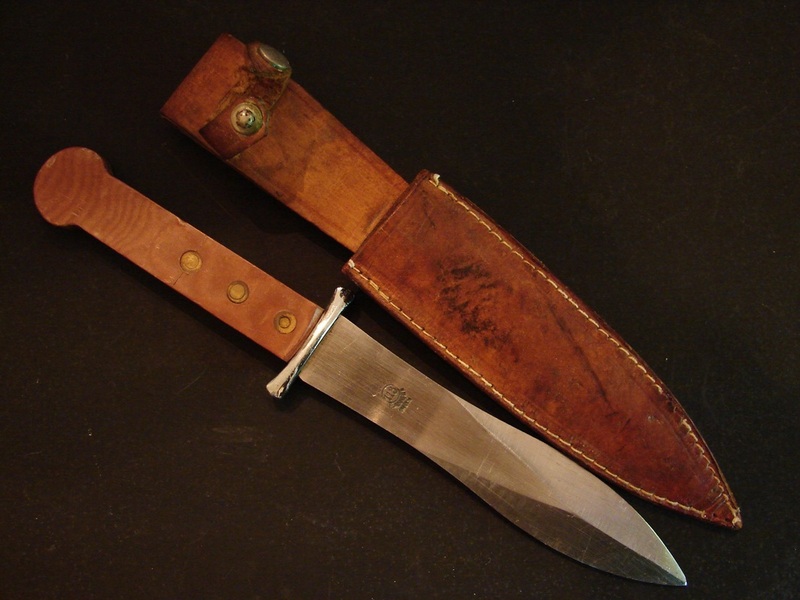 Shown below: is one of the knives with a typical French sheath. The sheath may be of post war manufacture, dating to perhaps the 50s or 60s. I believe that originally they would have shipped with a standard P-2 style sheath or the flat "commercial style sewn up the sides. They might have also used sheaths without a chape like those supplied with some of the mini-daggers. BELOW: Please excuse the incongruity here. 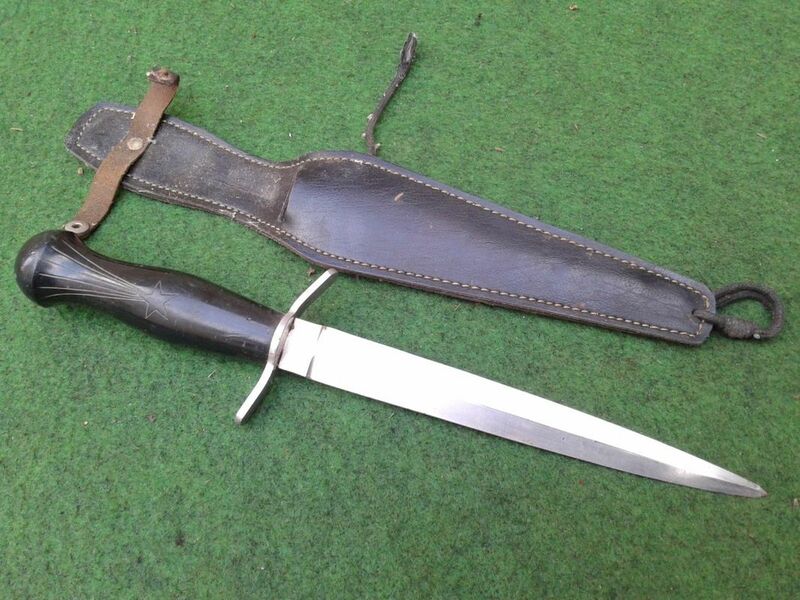 Although this is a genuine WW-II sheath it belongs with an Australian Commando Dagger not this French one. There are a couple Post War French knives pictured in the section dealing with knives of that era. Since the manufacture of these knives are mostly from the 1940s it is nearly impossible to say with conviction that any knife you buy is in its original sheath. 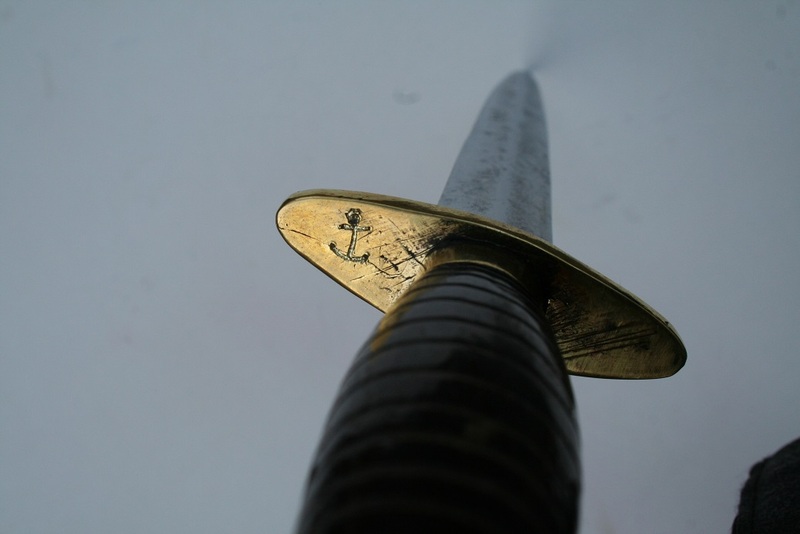 Many knives may have outlived two or three sheaths during the war itself. Quite often either the owner or a collector/dealer confuses the issue by mix-matching knives and sheaths either on purpose or accidentally. One can only say that this style of knife "usually" came with such and such style sheath and go from there. 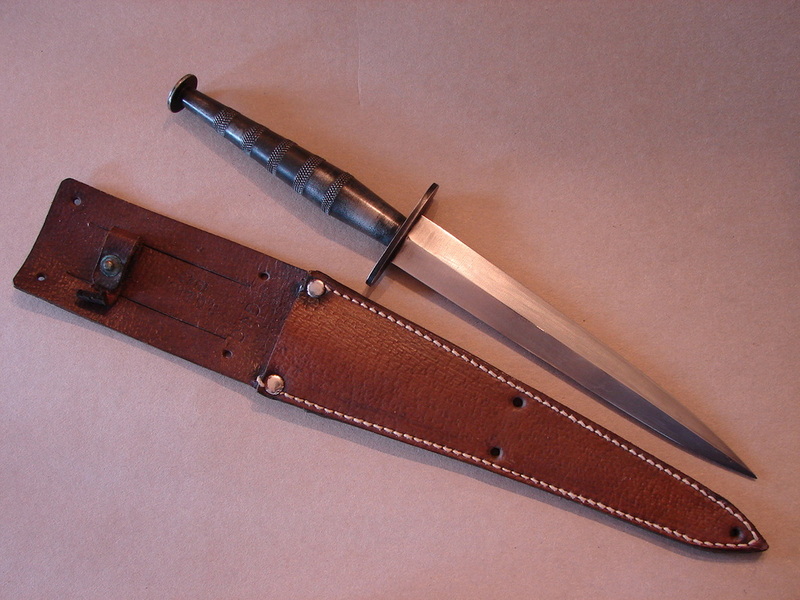 I have since paired this sheath with an Australian Commando dagger. Shown below: (and on the pages about modern F~S) is another very nice example of a Vietnam era French "Le-Commando." These are a very rugged version of a third pattern with a broader blade made from stainless steel, a larger guard, and ribbed handle. This model has a very well made sheath that includes a boot-belt clip. Cheaper versions exist with a hard rubber type handle and lighter weight blade. Below: Here is a "French Avenger." This knife may have served in two world wars. First issued in WW-I they were still being used during WW-II. It is a rugged knife with steel cross guard and walnut handle. These have well formed blades with a rebated ricasso. They came fitted with a steel sheath with integral belt loop. 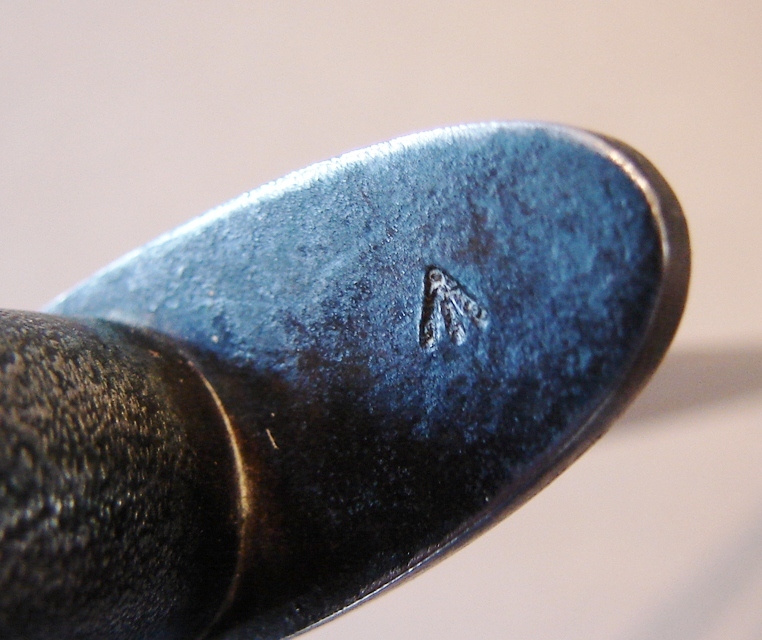 The knife is held in by the friction of a steel retainer spring with tends to cause the scrapes you see on the ricasso. Mon Dieu! Here are two Fakes! 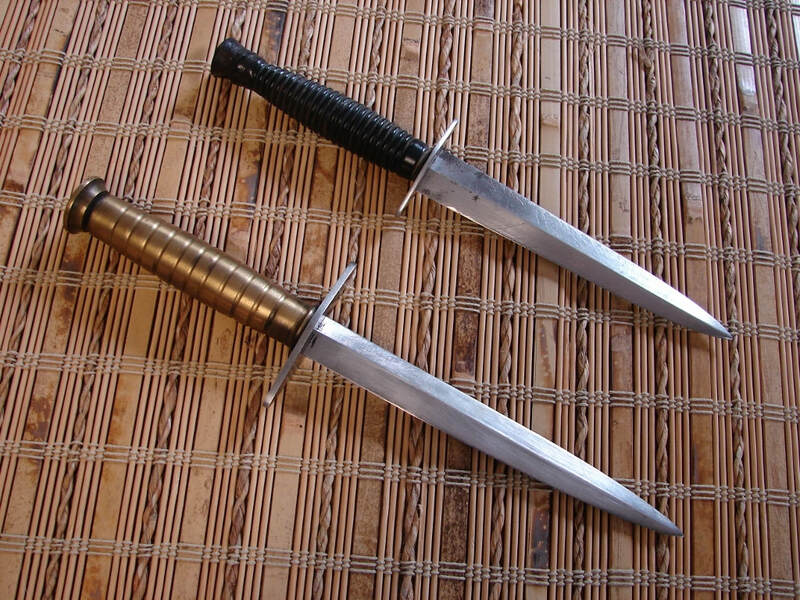 Below: The following two knives are replicas of WW-II knives and NOT originals. One of them was made using a standard third pattern blade and a generic guard. The handle was turned and knurled by a machinist friend and is a very close copy of the originals. I had this made before I found the two originals illustrated above. The other knife was given to me as a gift by a friend. He made the blade from a file (as many resistance knives were). 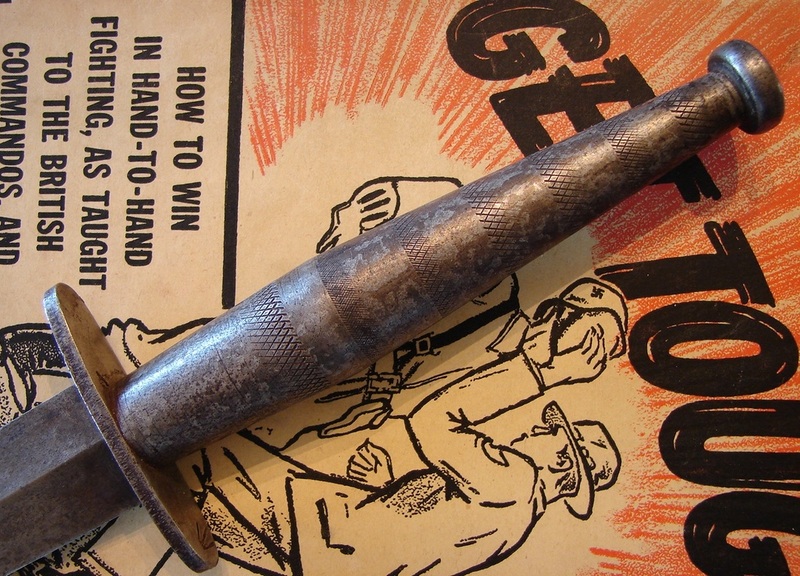 The small steel guard and a knurled handle came from some tooling he found at a Flea Market. He annealed the file and stamped it with the French Resistance motto "Morte Aux Bosches," or death to Germans. I made the sheath for it. The combination is quite convincing and I have tagged it as a replica for future reference. Sometimes a replica is all one can afford or find to fill out a vacant niche in a collection. To preserve the integrity of your collection you should always identify any known replicas as such, when possible. Sometimes it is difficult to differentiate. As your collecting acumen grows you may find it necessary to move a knife from one category to another. Sometimes the more rare the knife the more difficult it becomes to filter out the fakes or reproductions. Why? Well for one thing if it is truly rare then there are few specimens to compare and those people with knowledge of them are also few and far between.